Well meaning, but meddlesome matchmaker Emma Woodhouse is the heroine in Jane Austen's classic novel Emma. You can request a copy to read, watch, download or listen to from the Library. Otherwise, here is a selection of contemporary works inspired by this classic tale. 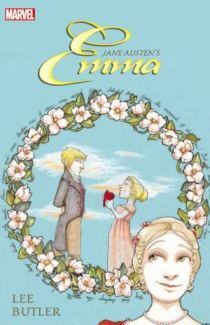 Jane Austen's Emma by Nancy Butler, illustrated by Janet Lee. Add a modern twist and read this unique and enjoyable retelling graphic novel. A colourful simplified version, this is a great introduction to the classic novel for younger readers. Mark Knightley - handsome, clever, rich - is used to women falling at his feet. Except Emma Woodhouse, who's like part of the family - and the furniture. When their relationship changes dramatically, is it an ending or a new beginning? With its clueless heroine and entertaining plot, this modern re-telling of Jane Austen's "Emma" stays true to the original, while giving fresh insights into the mind of its thoroughly updated and irresistible hero. Emma becomes Clueless in this contemporary movie inspired by Jane Austen's original tale.